Motherhood can be stressful, and for those connected to the military the pressure can be even greater. But free help is on the way for military moms at Arizona State University. 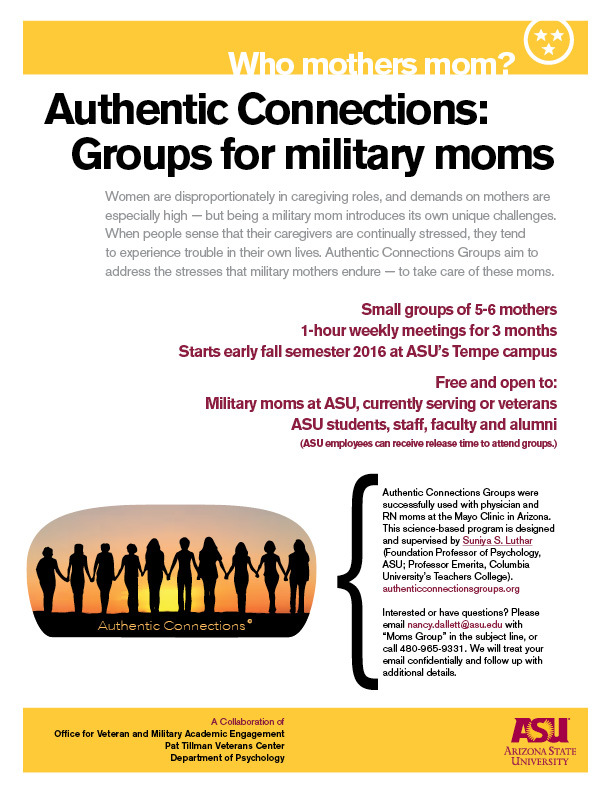 This will be the first time the Authentic Connections groups will form at ASU to work with military mothers. Organizers are looking for university-affiliated military moms in active service, veterans, guardsmen/reservists or anyone else serving in a caregiving role for significant others in the military, said Luthar. Luthar and her group are committed to working with mothers who by the nature of their life circumstances or professions are under more stress than most. Moms in the military — or with military spouses — certainly meet this criterion. The Authentic Connections concept was recently tested at the Mayo Clinic here in Arizona with mothers who are medical-care providers, including physicians, registered nurses and physicians assistants. Like physicians, military moms are women who display remarkable personal strength and resolve in their professions. Being a “good enough mother” month after month, year after year, is hard enough under the best circumstances, Luthar said. “When mothers experience high everyday stress, it is essential to ensure that they receive ‘tending’ themselves, on a regular basis,” said Luthar. Focusing on military moms made sense to Luthar. She highlights three reasons why. Luthar is a mom of two grown children herself and understands first-hand (and not just through her research on resilience), the enormous challenges associated with being a parent — especially when one is the primary parent and raising kids under conditions of high everyday stress. She is committed to doing all she can to ensure that all mothers in these circumstances regularly receive "mothering" themselves. The Authentic Connections program for military moms at ASU is a collaborative relationship among Luthar, the Pat Tillman Veterans Center and the Office for Veteran and Military Academic Engagement. Organizers want to recruit and start the groups the week of Sept. 12, said Nancy Dallett, assistant director with the Office for Veteran and Military Academic Engagement. The groups will meet for one hour once a week for three months. Military moms interested in participating should email Dallett at nancy.dallett@asu.edu and include “Moms Group” in the subject line. She may also be reached at 480-965-9331. Sports mascots, music lyrics, Halloween costumes, hairstyles, face paint: Arizona State University professor Neal A. Lester says cultural appropriation can take many forms. It can be hurtful when one group borrows from another without proper credit, Lester said, adding that in most cases people aren’t aware when they’re being insensitive. To address it, Lester has started a yearly symposium to discuss self- and cultural-awareness with young people from across the Valley. The third-annual discussion, “Cultural Appropriation: Critical Dialogues on Cultural Awareness,” starts at 8:30 a.m. Saturday at ASU Preparatory Academy in downtown Phoenix. Lester said he expects about 250 Phoenix-area high school students to learn about and discuss the value of advocacy and personal responsibility in an all-day workshop led by ASU students and faculty, along with a group of high school seniors. It’s about “knowing the ways in which we can be more culturally sensitive and respectful to others,” said Lester, Foundation Professor of English and founding director of Project Humanities. Lester started the gatherings in 2014 after students painted their faces black at an ASU football game. He said their actions didn’t offend him because they most likely had no historical understanding of blackface, an entertainment industry practice from the 1800s that perpetuated negative black stereotypes. Anna Avila, a 17-year-old at Chandler’s Hamilton High School, attended last year’s symposium. She said that at the time she didn’t know what cultural appropriation was and that she didn’t want to attend the event. She learned so much from the conversations, however, that this year she’s a facilitator.